This is not a drill. The best coffee in Stevens Point is right at UWSP! Our talented baristas make hot and cold drinks to perfection, every time! They open at 8am for the normal morning fix, and they close at 11pm for that all-nighter fix. Feed your addiction while also supporting your fellow classmates! Yum, yum, yum! This coffee shop is located right downtown and is a perfect place to grab your favorite hot drink while exploring Stevens Point! They have the most extensive menu, ranging from a Nutella Latte to simple light and dark roasts. Open 7 a.m. to 7 p.m.—seven days a week! The employees here are some serious coffee connoisseurs. At any given time, an employee would be able to describe the coffee origin and description of what exactly is in your cup. For those who share a passion for great coffee that’s certified organic, this place is for you. They also sell 16 different kinds of hand scooped ice cream. I know I am sold. This place has the best frappes ever. This is a bit of a walk from the university, but so worth it! This is a drive-thru style coffee shop that is the size of a walk-in closet located in a parking lot of Church Street. So good and such a different way of getting coffee. We all love a family owned business and we all love coffee. Goodie for us, Zest is both! 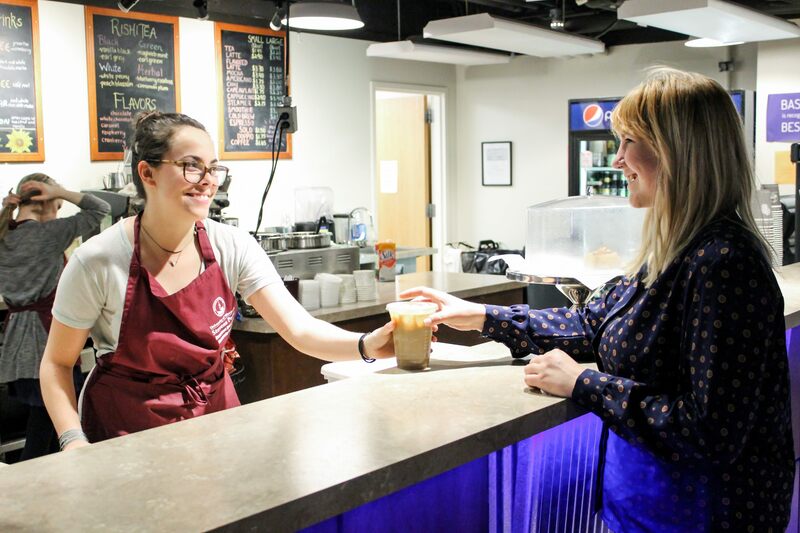 This coffee shop is located a mere five steps from the dorms and classrooms at UWSP and is a popular place to pick up a panini or better yet, a piping hot cup of joe. Go local! Starbucks has been going strong since 1971. This popular coffee shop is always busy, and for good reason! Specialty drinks, good atmosphere and free Wi-Fi! This place is perfect for the coffee addict and the person who doesn’t yet know how they feel about coffee. Their selection is made for everyone and even includes some extras like smoothies and pastries. This coffee shop is a hidden gem. Located in a gaming lounge, you know that their coffee has to be good to make sure their customers stay awake until midnight, which is when they close Tuesday-Saturday. I can’t say enough about this shop, except you must try it! Need I say more. McDonalds has good or bad coffee depending on who you ask. However, their coupons are the former. For those of us on a budget, McDonalds offers numerous coupons that make your costs go way down. With easy hours, lots of options, and in my humble opinion—good coffee, McDonalds is a place to consider next time you need some coffee.